At Bosch Group, training and skill promotion bring back best performance – of the employees and accordingly of the company as such. But how to implement this intention consistently? In an era where leadership and entrepreneurship are at the core of the debate, we all acknowledge the fact that successful founders can change the world through their vision. But that was not so clear over 130 years ago when Robert Bosch founded his company and revolutionised the social market economy while aiding the development of the automobile. Today, his life’s work is continued by the Bosch Group which employs roughly 390,000 associates worldwide and by the foundation into which he breathed life, the Robert Bosch Stiftung. Robert Bosch’s legacy is based on the assumption of social responsibility. Among his contributions to the society and the labour market was the introduction of an eight-hour day in 1906 and the advocation of industrial arbitration and free trade – and this impact is once again relevant in today’s world. “Let´s be remarkable” encourages the firm after you made your first steps into the huge building that prevails over the skyline of Feuerbach in Stuttgart. In this hood, many passers-by wear Bosch´s shirts and carry cards around their necks from the company focused on four business sectors: Mobility Solutions, Industrial Technology, Consumer Goods, and Energy and Building Technology. Gone are the days dedicated only to mechanics. Nowadays as a leading IoT company, Bosch delivers innovative solutions for a connected and better life that have sparked not only enthusiasm over 60 countries but also generated new jobs. 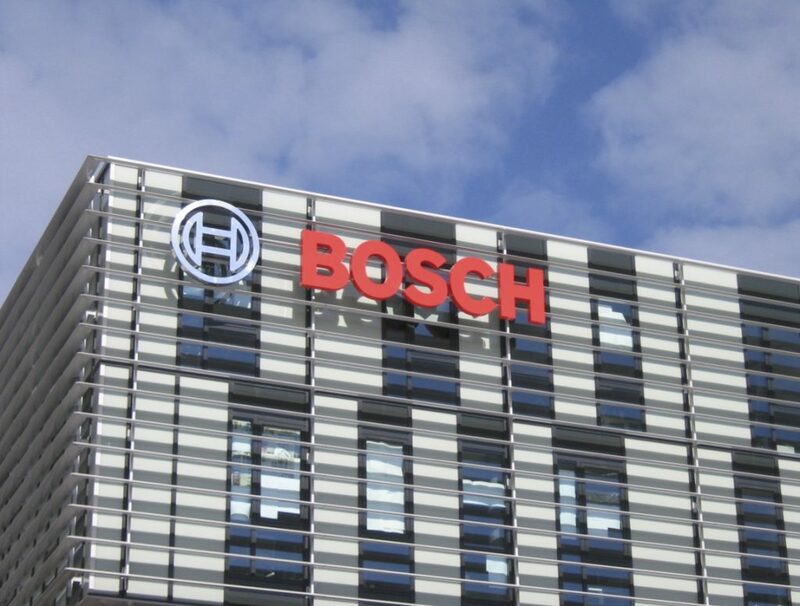 “This year, Bosch is planning to recruit about 20,000 specialists and executives worldwide. People with professional experience and software skills, including mechanical engineers and software developers, have especially good chances” says Christoph Kübel, member of the Board of Management and Director of Industrial Relations at Robert Bosch GmbH. The core has always been to turn innovative visions into reality and to improve the quality of life for people all over the world. As a result, cars drive autonomously, machines speak to each other, and houses become smarter thanks to the joint work of professionals from more than 150 nationalities in 440 subsidiaries and regional companies around the globe. Different ideas, experiences as well as working styles have always formed part of the Bosch identity and, as part of the German “Diversity Charter”, they officially recognise and value diversity. What does this mean for Southern Europe? From 2014 to today this mindset and the company’s social responsibility involve 175 additional apprenticeships for young men and women from Italy, Portugal, and Spain and around 14 million Euros available to combat the high level of youth unemployment. “Our occupational training concept has strong intercultural assistance such as language courses, professional mentors, and social-educational supervision. Vocational training significantly improves young people’s job prospects” affirms Mr Kübel. Since 2014, the company offers 175 apprenticeships for young talents from Italy, Portugal and Spain. But, what is the apprenticeship all about? In search for the answer, we talked with Siegfried Czock, Head of Occupational and Professional Training Policies at Bosch. His first words are devoted to the great value of diversity within the company and the extraordinary human capital who shares Bosch´s philosophy of work. “The young southern Europeans learn their future occupations at 16 locations throughout Baden-Württemberg and Bavaria. Three and a half years later, they earn their Chamber-of- Commerce-recognised qualification as industrial mechanics, cutting machine operators, equipment operators, or mechatronics engineers”, explains Czock. After twenty months in the program, the apprentices complete the first part of their exams. German remains a particular challenge in the written theoretical portion. “It is a big step, being so far from home,” says Ana Maria San Andrés González from Madrid, who has just finished her training to be a mechatronics engineer. “That’s why it’s also important for me to find my way outside of work and feel at ease. My trainers, colleagues and vocational school teachers support me in this every day.” Intercultural training, constant supervision and above all language courses are some of the success factors. In similar projects throughout Germany, the drop-out rate ranges from 40% to 100% while Bosch reaches 15% as 37 of the original 45 participants finished the program. What are the entry options at Bosch? Vera Winter, responsible for the acquisition of young talents at Bosch, sounds enthusiastic when talking about career opportunities in a company that provides employees with the room to develop their talents and personal strengths. “It is this diversity that makes us innovative and strong”, she says. “There is not only one way to start making the difference with us, so you can choose the entry option that fits best to you – for example our Junior Managers Program, the Graduate Specialists Program, PhD program, Pre-Master program or direct entry”. International, interdisciplinary and interdepartmental projects are just as much a part of Bosch´s business as the use of English as their international business language. “In general, the technical field takes 80% of positions and ⅔ are on IT/software”, explains Winter. “In most positions German is necessary, but in others it is helpful”. It requires excellent expert knowledge, social competences, flexibility, self-responsibility and good language skills, to fit into any of the wide range of possibilities within Bosch. Whether as a compulsory or as a voluntary internship, whether in Germany or in one of 60 other countries worldwide: this is a valuable head start towards future. “We offer various STEM and business internships that will give the successful applicant a wide and varied understanding of the organization, the department and the way we work”, affirms Winter. Interns are part of the team that they are supporting and gain a valuable experience during their 3-6 month placement in return for a maintenance contribution. Working students can work directly on the topics of the future – join a project and support it over the course of several important phases. Once they are enrolled in a course of study, they can get on-the-job experience as a working student. “Working hours are adapted to your studies and free time: during studies, 10 hours per week up to 35 hours during semester holidays”, explains Winter. “And if you want to join Bosch at a later point in time, we will be sure to remember you”. There are many visionary developmental goals at Bosch that provide a wide range of fascinating topics for a Bachelor’s, Master’s, or diploma thesis. While working on their final thesis, students will be mentored both personally and professionally throughout the entire process. “Working with your subject at the crossroads between theory and practice leads you to the expansion of your own network early in your career”, Vera Winter points out. A Master’s degree requires very good preparation, both in terms of theory and practice. 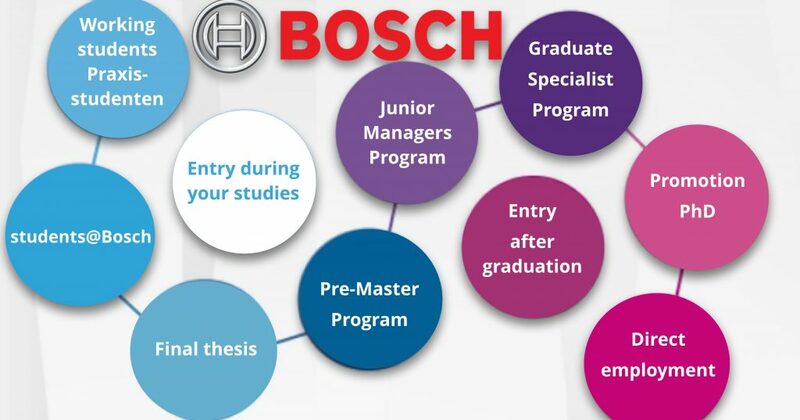 Therefore, the Bosch Pre-Master Program trains graduates during max. 12 months to gain experience in their field and its interrelations with business. “Requirement is a Bachelor’s degree in a business or technical field with very good final grades”, explains Winter. “Your professional and personal qualification is also being developed in seminars during that time”. From the very start, graduates take on responsibilities in daily business and in projects suitable to their own interests and strengths. About 90% of managers at Bosch come from their own ranks. After the completion of a master course of study in a technical, scientific, or business field with above-average grades and at least one several-month stage abroad, students with leadership potential can opt to enter the program with an open-ended employment contract. The duration of the program is around 18 to 24 months and it has been among the best in Germany. The start date of the Junior Managers Program can be individually arranged and is based on an individual program design, diverse further training opportunities, and an established mentoring system with experienced top managers. You completed your college/university degree or post-graduate studies in a technical, natural sciences, or business discipline with outstanding grades. Your track record includes relevant work experience. During a period of 18 to 24 months, you complete four to six assignments in your functional area, as well as being actively involved in day-to-day business and projects with an unlimited employment contract. Around 59,000 innovative minds are driving the technical challenges of the future, working in research and development at Bosch. “We have exciting subjects on offer for PhDs which often grant students the opportunity to break new grounds”, says Vera Winter. Bosch provides excellent Master graduates with financial support as part of a limited-term work contract (3 years in a technical area and 2 years in a business area). As a professional partner for their doctoral thesis, the company offers also intensive personal support in the related department.